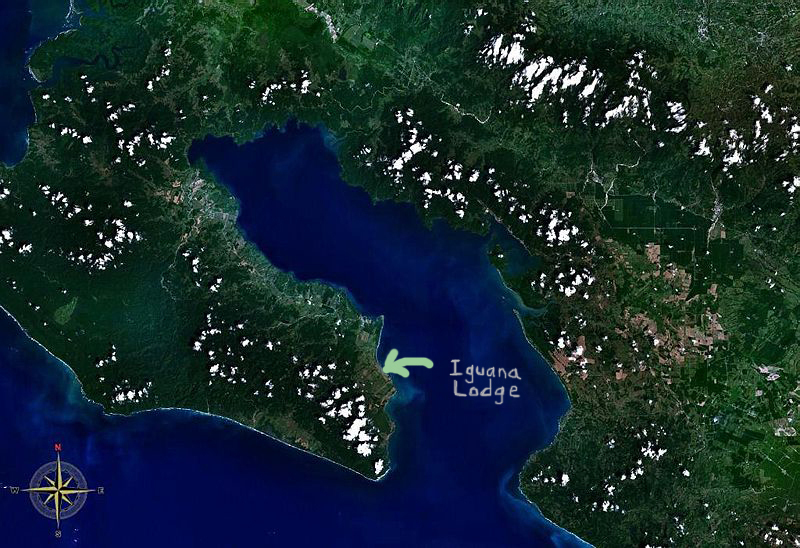 Pura Vida was on our minds when our driver found the hidden gem named Iguana Lodge, an eco-resort operated ironically by two former trial attorneys from Colorado, where we live. 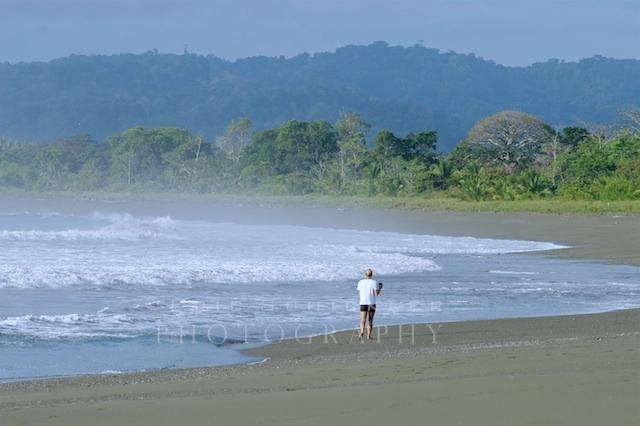 Nestled contently in the tropical rainforest, just a few hundred yards from the beaches of Golfo Dulce, the small lodge fosters a tranquil, sedate, relaxed feeling. It is an isolated and private oasis where no oasis is even needed—in the middle of a massive tropical paradise. Our home for the next week was situated just a few hundred feet off the finest beach on the Osa, Playa Platanares (locals call it “Playa Preciosa”). My friend and traveling companion, Ana, and I were greeted with mango daiquiris and another “Pura Vida,” this time from someone in a colorful sarong with a warm smile and fresh flowers, and much better looking than the burly judge-and-jury, baggage-weighing pilot. “We are so happy to be here,” said Ana. Like two five-year-olds bolting from the classroom on the final day of school, we scooted 200 yards down a shaded, meticulously manicured path. 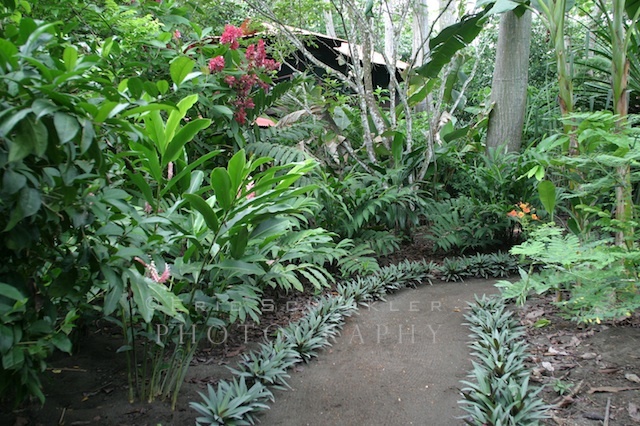 It was a living corridor of plants, flowers and all kinds of broad-leaf trees. Before we could say Robinson Crusoe, we emerged from our tunnel and onto the beach. A very deserted beach. The hectic pace of the travel day had just melted away. With our minds and bodies at ease, our seaside jungle experience was underway. 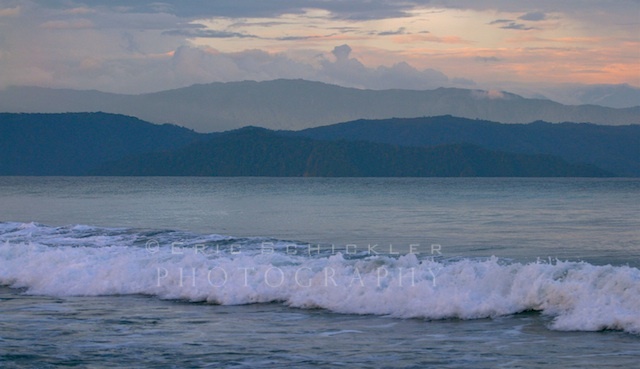 It was just one hour after our plane landed on the Osa, and “Pura Vida” had already sunk in. We explored the beach for hours, unwinding more with every step. We came upon a river outlet, and walked inland slightly to explore. Beyond the tree line was an enticing lagoon, but its sole proprietor greeted us as we approached. A large caiman, looking for lunch! We moved back toward the gulf rather quickly, hoping to extend our vacation beyond the first two hours. Now we knew why they highly recommend using guides whenever you venture off into the jungle. The beach would be just fine for now. Back near the lodge, we found the secret trail, dipped back into the dense wall of trees, and it was Garden of Eden time. The warm humid breeze gently tossed the palm fronds and supple plants to and fro, creating a kaleidoscope scattering of soft light. 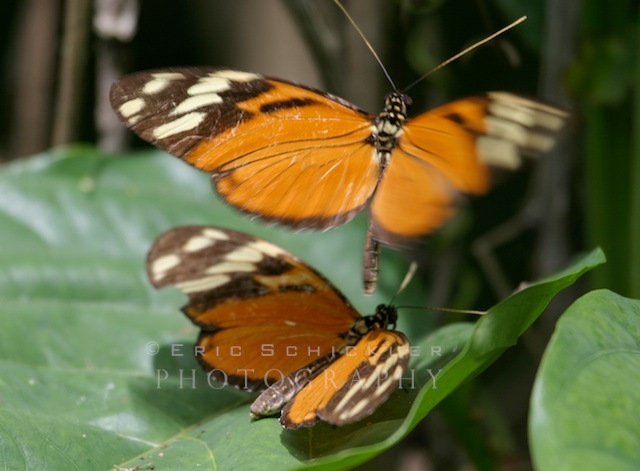 Butterflies and birds of all colors and sizes danced on the dense air. Reptiles slithered in the ground cover. Monkeys rattled the branches above us. 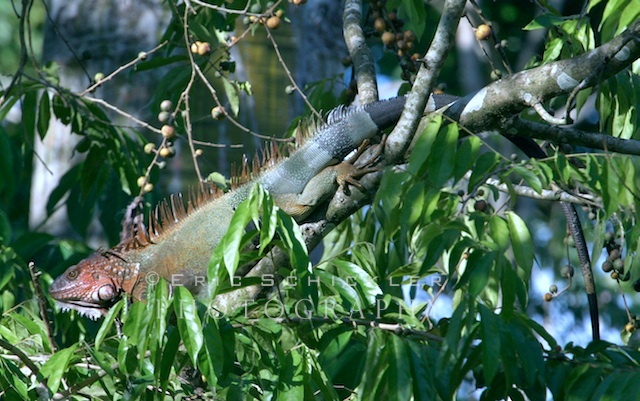 A large iguana crawled slowly along a tree branch, munching away at the foliage. A brightly colored waterbird sipped from the lodge’s stone fountain, which was surrounded by a garden of vibrant flowers, including the unmistakable bird of paradise. All this tropical adventure and sensory overload was making us hungry. We geared up for one of the resort’s most talked-about features–its food. 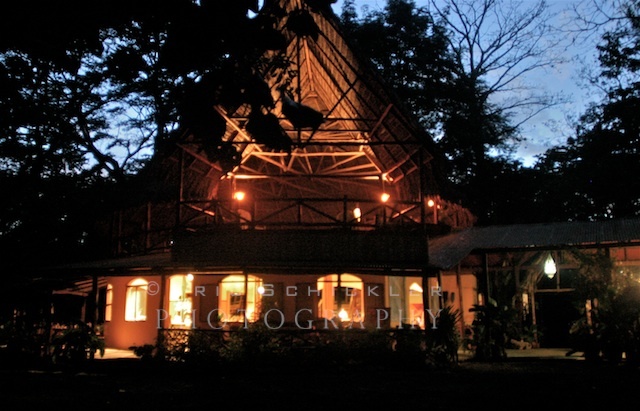 Iguana Lodge offers outstanding international cuisine and local fare. The creative meals feature fresh, healthy ingredients, and the cuisine has attracted rave reviews, ranking among the best in all of Costa Rica. The breakfasts featured incomparable Costa Rican coffees, considered some of the richest, most aromatic and most flavorful on Earth. Then came our Adam & Eve experience. A giant tray was brought out from the kitchen, loaded with a cavalcade of local fruit treasures: fresh cut mangoes, papayas, melons, pineapples and bananas. Next came entrees like eggs benedict, huevos rancheros with rice & beans, and banana crepes. And finally, the sinful homemade pastries. Then more delicious coffee. Later in the week, before leaving the country, we would take a tour of the Cafe Britt Factory that produced this fine coffee in Heredia, just north of San Jose. 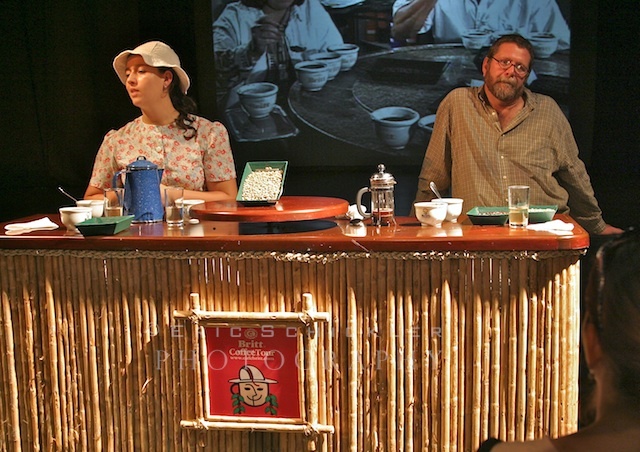 We were treated to educational, humorous and theatrical presentations that took our knowledge of coffee to a new slow-roasted level. This tour has become one of the country’s most popular. We learned the history of coffee, the growing and harvesting processes, how it is manufactured and the best way to brew and drink it. We also enjoyed complimentary coffee the entire time we were there. Despite the tour’s three-hour duration, I can’t recall one person getting sleepy. This was not your average dining experience at the lodge. Breakfast was enjoyed on the outside verandas, where just feet away tropical birds rustled about in the rain forest canopy, emitting so many varieties of songs and chirps and whistles you felt a symphony was warming up in the distance. A male mantled howler monkey broke the morning calm with its baritone roars, causing more than a few startled guests to spill their treasured coffee. If these animals don’t remind you that you’re in the jungle, nothing will. They are found in great numbers in Costa Rica, and are best known for their resounding howls, audible for a half-mile or more. They are very vocal at dusk and dawn and, like dogs, will also howl at thunder, planes and humans. After the howler settled down and the fresh fruit and pancakes arrived at our table, the serenity was again shattered, this time by the Osa Peninsula “Air Patrol,” approaching from up the beach. 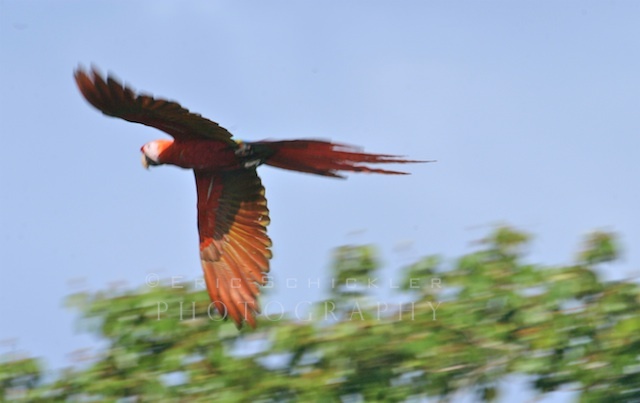 The raucous, inescapable signature squawks, coming from two large scarlet macaws, startled us as much as the howler monkey. We always knew when they were cruising the tree line near the beach, and we knew when they had passed by. Reminded me of an ambulance with its siren blazing—impossible to ignore. They are often seen in pairs “patrolling” the beaches, landing in the very tall almond trees and enjoying their fine bounties. 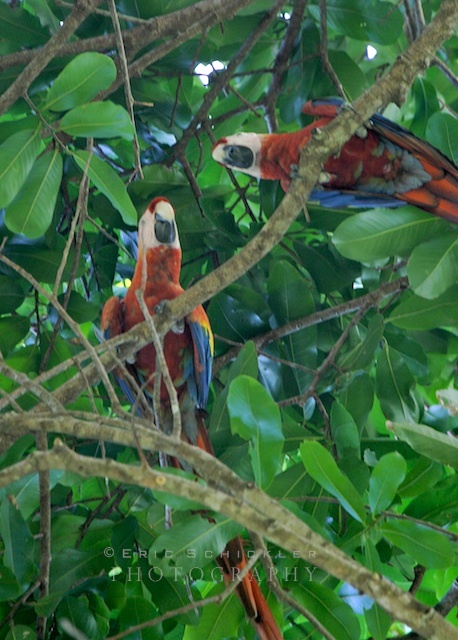 They are quiet when feeding in the treetops, are very difficult to get near and rarely, if ever, come down low in the canopy. 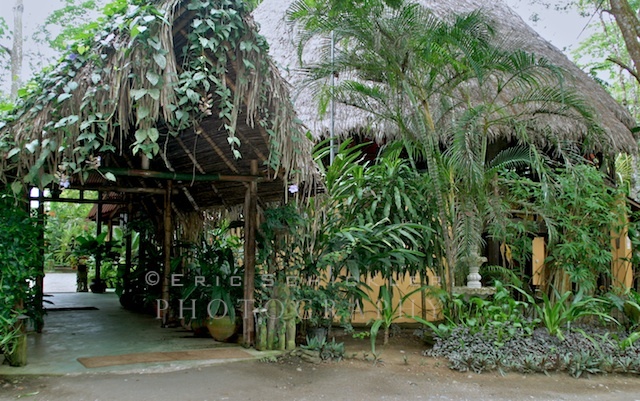 The Iguana Lodge Resort was situated around a main lodge called “Rancho Grande.” It is a two-level, open-air building that looks as if it grew from the forest floor, with native hardwoods, ornamental woods, bamboo trim, and a towering thatched roof. 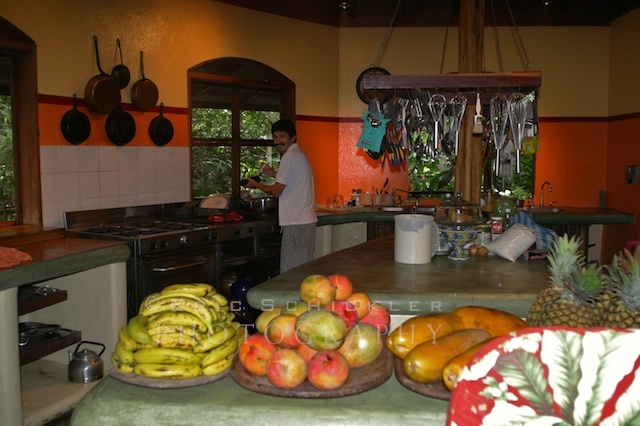 Its large open kitchen was always bustling with activity; cooks meticulously cutting up the fresh fruits and vegetables that were brought in daily. The upper-level great room was used for quiet relaxation, happy hours and gourmet dinners. A large cooler was stocked with juices, champagne, wine and beer, and was a popular place to visit. Guests simply recorded what they consumed on the “Honor Bar” Drink Register. At week’s end you pay a lump sum for your total. The running joke all week among the guests was betting on which couple would have the most painful bar tab. 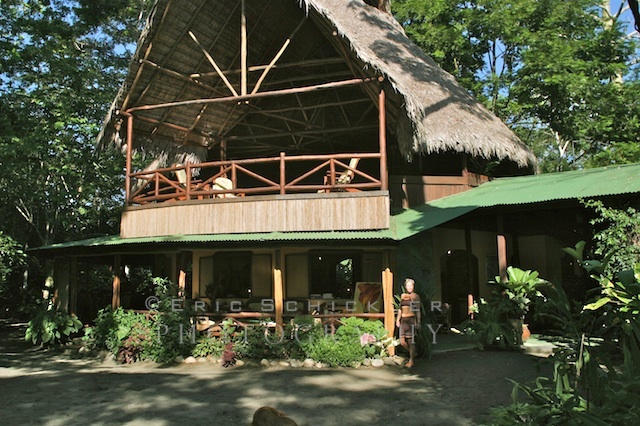 We stayed in one of just a handful of cozy two-story casitas (or cabinas), set on pillars and nestled in the dense forest. The casitas’ decks had inviting cushioned bamboo furniture and a relaxing hammock, shaded under flowering tropical plants and trees. Inside was a large and luxurious mosquito-netted bed, screened walls, and artistically designed “garden bathrooms” with semi-open outdoor showers. We discovered rather quickly and happily that insects and mosquitoes were quite scarce. But somehow an occasional tree frog, crab or gecko would sneak in to visit. We found out why the next morning. The resident cats stay busy all day chasing the geckos along the resort’s trails, an entertaining side show for us while we’d swing lazily in the hammock during afternoon siesta. The resort does have electricity, but a portion of the power reserves are from sun-powered generators. Most of the lighting at night is with candles. This creates quite the ambiance. New amenities added recently have brought a touch of luxury and culture to the resort. Guests can now exercise in a 65-foot lap pool, frolic in a jacuzzi, hit either of two salsa dance & yoga studios, kick back for some peaceful reading in the library and browse in the art gallery. After experiencing guided outdoor adventures and activities during the day throughout the peninsula, guests gathered at dark (about 6 p.m. year-round due to our proximity to the Equator). Guests who caught fish on deep-sea fishing excursions often added their catches to the culinary mix, so every night was a different seafood surprise. Nightfall coincided with dinner. All of the resort’s 24 guests gathered around four long tables, which were arranged in a large square formation. 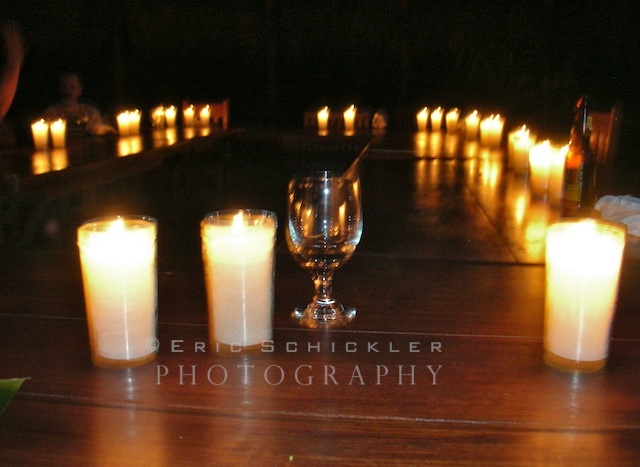 A high number of candles ringed the tables, and represented the primary source of light. It created a rich, warm, comfortable atmosphere, spawning robust conversation. Stories that started at happy hour continued through dinner. So many colorful anecdotes of the day’s adventures at sea, in the trees, on the beach, in boats, on kayaks, on ropes and or on horses–many becoming more embellished as the wine flowed. Each night we sat next to different guests, so by week’s end we had become acquainted with nearly every cast member from Gilligan’s Island.